At least nine tornadoes touched down during Monday’s round of storms in north central Illinois, the National Weather Service has confirmed, causing severe damage and knocking out power for thousands. The tornado that struck Coal City and the Braidwood area has been determined to be an EF-3 tornado, the National Weather Service confirmed Tuesday. The designation is the third highest on the scale that measures the strength of tornadoes. 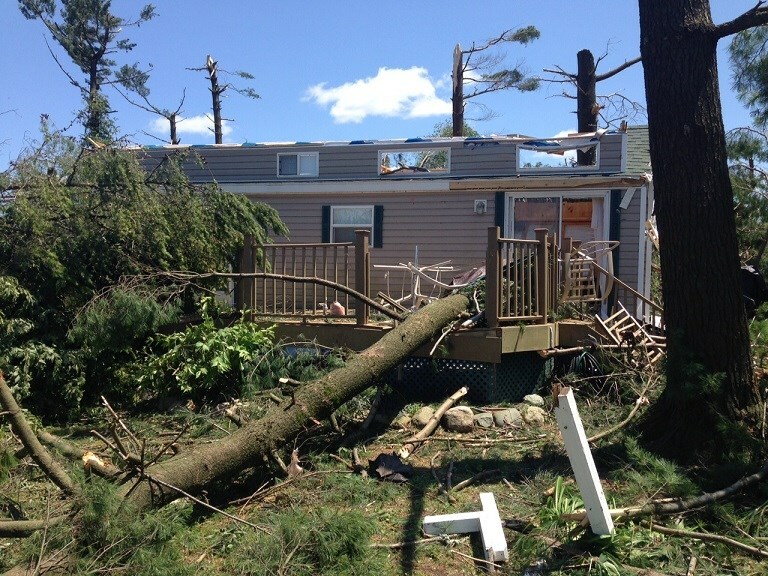 EF-3 twisters pack strong winds of 136-165 mph, the weather service said. It was one of nine confirmed tornadoes that spun off from one long supercell thunderstorm that moved across northern Illinois Tuesday night. The storm also brought torrential rainfall of 3-5 inches to areas already saturated with recent rains. A second tornado, a high-end EF-2 tornado, left a path about one-half-mile long from Woodhaven Lakes to south of Sublette, with estimated wind speeds reaching 130 mph. Two other tornadoes, both EF-1 in strength, touched down separately on either side of the village of Harmon, and a third EF-1 touched down near Mendota, the weather service said. Three other EF-1 tornadoes were confirmed to have touched down to the north of Ottawa, to the north and east of Kankakee, and southwest of Coal City, parallel to the path of the EF-3 tornado. A ninth tornado, an EF-0, passed south of the village of Herscher, the weather service said. Gov. Bruce Rauner issued a state disaster proclamation for Lee and Grundy counties early Tuesday to make state resources available to help communities respond and recover from the storms. The State Emergency Operations Center was activated in Springfield on Monday evening. Additionally, the Illinois Task Force, an 80-member search and reduce team, was deployed to the Woodhaven Lakes campground in Lee County. National Weather Service survey teams are continuing to investigate other possible tornado damage in over the coming days. “Tornadoes and severe storms have once again caused devastation in northern Illinois communities,” Rauner said in a statement. “The state is supporting local responders in these hard-hit communities to ensure the safety of people affected by these terrible storms and help them begin the recovery process,” he said. About 60,000 ComEd customers were without power at the height of the storms, but nearly 90 percent have been restored as of Tuesday evening, spokeswoman Annette Martinez said. About 6,800 customers remain without electricity, mostly in the areas hardest hit by tornado damage, Martinez said. Roughly 600 ComEd crews are working around the clock to restore power, and are removing debris and installing new poles where necessary, she said. As daylight arrived Tuesday, officials said the tornado that churned across Coal City, a community of about 5,000 people, had not taken any lives. Five people were transported to local hospitals with minor injuries, officials said at a press conference in neighboring Diamond. “At this point, we believe we’ve accounted for everybody,” said Deputy Chief Todd Friddle of the Wilmington Fire Protection District. The weather service is also warning of an enhanced risk of severe thunderstorms on Wednesday, which could produce very heavy rainfall. Because the ground is nearly saturated in some places, more rain could result in immediate runoff and potential flooding, the weather service said. A flash flood watch will be in effect for Cook, DuPage, Kane, Kendall and Will counties in Illinois and Lake, Porter, Jasper and Newton counties inIndiana from Wednesday evening through Thursday afternoon.